You’d think someone, at some point, would ask why so much money has been allocated to cancer research over the years, with so little impact on cancer mortality. Cancer research is important and should, of course, go on. But let’s not kid ourselves that it’s been cost-effective, because by almost any definition, it hasn’t been. Since President Nixon declared a War on Cancer in 1971, we’ve dumped $500 billion into the conflict—and the cancer death rate has hardly budged. I use the word “cancer” as if it’s one disease. It isn’t, of course. Like “heart disease,” cancer is actually a diverse assortment of horrors. 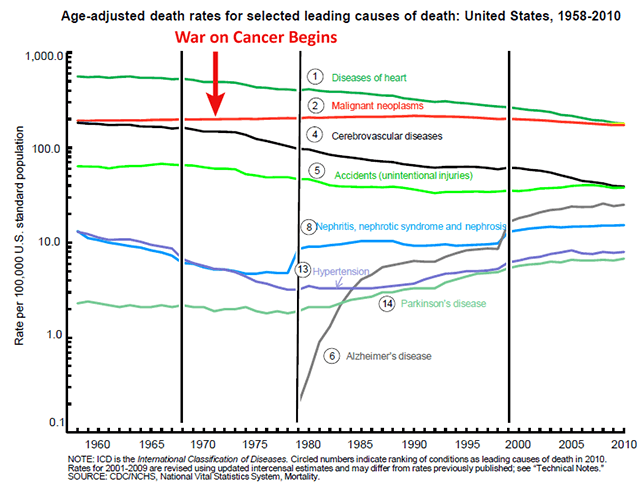 But it’s customary to count it as one disease in discussions of mortality in this country, so that we can point at it and say “Cancer is the Number Two cause of death in America,” and then presidents can declare war on it, $10 billion a year in taxpayers’ money can be set aside for research on it (approximately $500 billion in 2012 dollars spent since Nixon declared war) so that a $50-billion-a-year commercial industry of toxic therapies (some of which cost patients $10,000 a month) can be built around it, and meanwhile irrationally exuberant futurists can talk of achievable immortality in our lifetime (with arguments that don’t even come close to passing the straight-face test) when there’s no cancer cure in sight. It might do exuberant futurists some good to spend a little time pondering the fact that roughly $20,000 in anti-cancer research money has been spent for every single person in the U.S. who has died of cancer in the last 40 years; and yet cancer is still the No. 2 cause of death in America; and after it’s gone, after it’s cured once and for all, this No. 2 Cause of Death, we will have extended human life a grand total of (drum roll, please) a whopping 3.3 years (loud cymbal-crash).